Militants waged 88 attacks against the ATO positions. The situation in the area of the antiterrorist operation in Donbas is deteriorating as Russia-backed militants waged 88 attacks against the positions of the Armed Forces of Ukraine, killing three and wounding eight troops last day, the antiterrorist operation (ATO) HQ said on Facebook on 27 March. Most of the shelling was recorded in the Mariupol sector. In the hottest spots, Shyrokyne and Vodyane, terrorists fired 122-mm artillery, 120-mm mortars, grenade launchers of various systems and heavy machine guns. In Shyrokyne, Ukrainian marines were pounded from an enemy tank and targeted by snipers. Militants used 120-mm mortars against the defenders of Hnutove, Pavlopil, Lebedynske and Talakivka. An enemy IFV fired on Novotroyitske, Krasnohorivka and Maryinka were shelled with grenade launchers and heavy machine guns. In the Donetsk sector, the enemy employed almost the entire arsenal of heavy weapons against the ATO troops. The defenders of Troyitske were pounded with 152-mm artillery systems, 120-mm and 82-mm mortars. Also, the enemy used 120-mm mortars in Avdiyivka and Luhanske. The defenders of Kamyanka, Verkhnyotoretske and Avdiyivka were shelled with 82-mm mortars. A tank fired on the positions of the ATO fighters in the area of Kamyanka, while militants used IFV weapons against the Ukrainian positions near Verkhnyotoretske and Pisky. An enemy sniper was active in the vicinity of Troyitske. The Russian occupation troops shelled the residential areas of Avdiyivka with Grad-P portable rocket systems. ATO units returned fire to suppress the enemy attacks. 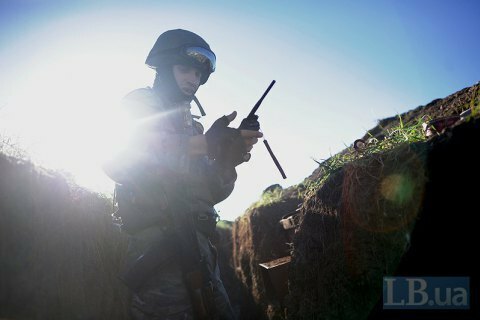 In the Luhansk sector, militants shelled the defenders of Novozvanivka with antitank systems. In the areas of Novooleksandrivka, Katerynivka and Krymske the enemy used grenade launchers. Two civilians were killed by shelling in the frontline town of Zaytseve on 25 March.